How was the Galileo spacecraft configured? About the size of a minivan with a flagpole sticking out of its side, Galileo weighed two and a half tons fully loaded. 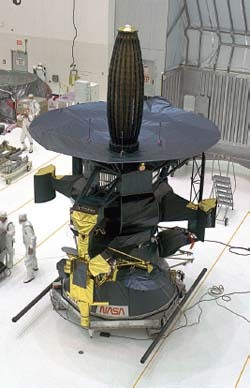 It contained a suite of scientific instruments, two communications antennae, thruster rockets, and radioisotope thermoelectric generators to provide power. Galileo’s mini-probe, about the size of a dishwasher, contained six scientific instruments of its own, designed to measure the conditions of its surroundings as it descended by parachute into Jupiter’s atmosphere.